BMI is a reliable screening tool to show potential weight problems, but is not a diagnostic tool. The BMI calculator results will only show potential excess body fat and weight problems. It takes a medical professional to correctly interpret the readings as they apply to individuals. For example, a high BMI score might be due to muscle mass, in which case the person will not be at risk. If you have a high reading, additional tests and and medical evaluation may be necessary. See your doctor if you think you might be at risk. The BMI Calculator works very well, but If you'd like to calculate your BMI yourself, follow these three steps. Work out your height in metres and multiply the figure by itself.Measure your weight in kilogramsDivide the weight by the height squared (ie. the answer to Q1). For example, you might be 1.6m (5ft 3in) tall and weigh 65kg (10st 3lb). The calculation would then be:1.6 x 1.6 = 2.56. BMI would be 65 divided by 2.56 = 25.39. Body Mass Index alone is not a good guide to who is at most risk of obesity and cardiovascular disease. Instead, waist circumference may be a much more accurate measure of future health problems because what matters is where you carry your excess kilos/pounds. People who are an apple shape - they store fat around their midriff - are far more likely to develop heart disease and diabetes than those who are a pear shape or more diffusely plump. A waist circumference greater than 80cm (32in) for women and 94cm (37in) for men indicates increased risk, while a measurement of more than 88cm (35in) for women and 102cm (40in) for men is particularly worrying. An even better measurement of risk may be the ratio of your waist circumference (the narrowest point on your abdomen) to your hip circumference (the widest point).A ratio of more than 1.0 for a man (in other words your waist is bigger than your hips) or 0.8 for a woman means you urgently need to lose belly-fat, reduce your weight and increase your levels of exercise. 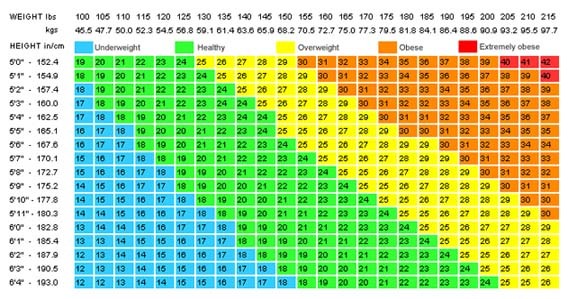 Using this chart is another easy method to work out if you are underweight, normal, healthy weight, overweight or obese. Although one of our weight loss tips was not to crash diet, a diet which aims to gradually change your eating habits can be a great way to lose weight as one element in making lifestyle changes in order to age well. Get the low-down on Weight Loss Diets and Weight Loss Products and add your own information about diets and products here. Lose that middle-age spread or fat across the middle. Visit the Belly-Fat Forum and add your own information, share your success stories and ask for advice here. Eight Tips for losing your Middle-age Spread.